Both these mid 70s records are very fine indeed and well worth seeking out. 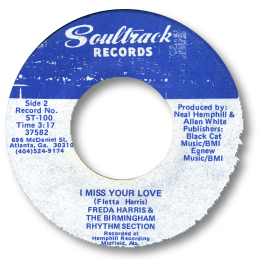 I Miss Your Love is deep soul personified as Freda sings out her troubles. She had a very good sense of timing – listen as she stretches out the verses here, and an excellent range. Love those high “moans”. A sparse arrangement – no horns - emphasis the mood and the background singers offer great support. 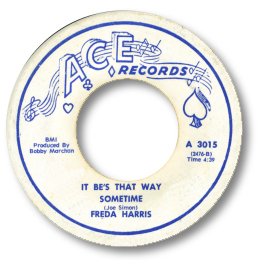 It Be’s That Way Sometime is more overtly bluesy and has an even more stripped down backing. It features a heavier, more emotionally intense vocal performance as well as Freda tells her tale of woe about a bad relationship. No matter how many times she repeats the refrain you can tell she’s having a lot of trouble convincing herself that she has to just live with the outcome. This gutsy singer only seems to have released a couple of 45s – but it I hope that unissued tracks will appear from the vaults in time. Note ~ a slightly different and shorter version of “It Be’s That Way Sometime” appeared on the Westside UK CD “Curiosities”.